I’m super excited about these. Sometimes vacation provides a little bit more than rest and relaxation. I’ve been thinking about making these for some time. After another visit to Florida I got out my shell collection from Sanibel Island and made some drawings. These like my leaf pattern towels are part of my NEW Sketchbook Series. I’m offering 2 colorways: Nautical Navy and Coastal Coral. They are available in shop NOW click here! 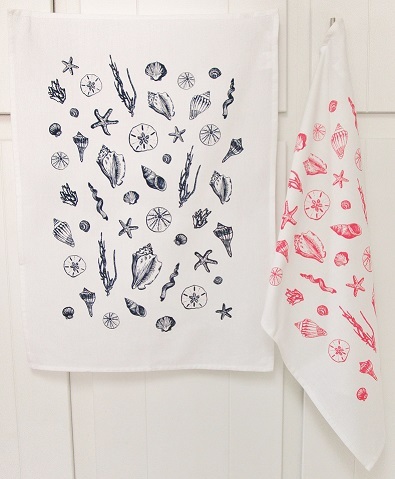 NEW organic tea towel designs! 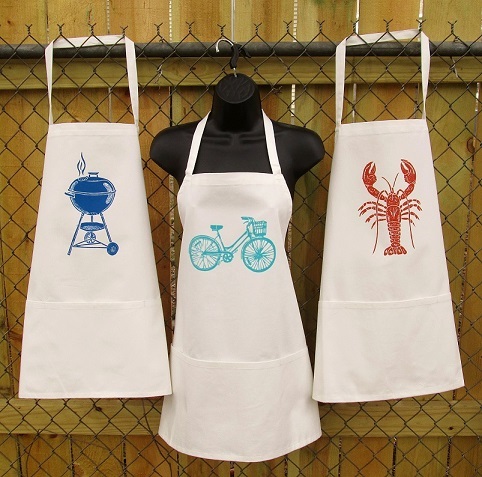 Well, if you looked at the NEW organic fair trade full aprons one of the NEW designs was a dead giveaway-the grill. Also NEW, the morning glory towel and the Michigan towel, and nope I don’t have any other states than the one I live in. Here they are are! PLUS I have a couple more on the way, should be releasing them this week! Yay! They are available for purchase right now! Right here! NEW NEW NEW! Full Organic Aprons! I’m releasing a bunch of NEW items this week! You may have seen some already if you follow artgoodies through social media. There’s even more NEW on the way this week and in a few weeks! I’ll be making a couple blog posts about them, starting with these NEW full aprons. Made of organic fair trade cotton. I have long since thought of sewing some from scratch like I do with artgoodies organic half hostess aprons but I found these high quality full aprons to print on and voila! Now available in shop in: lobster, blue bike, and NEW grill! 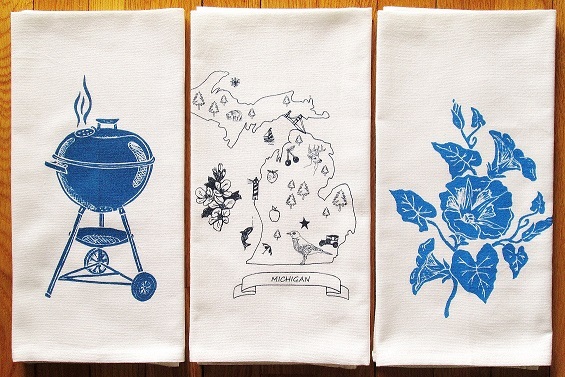 And yes, the grill is also available as an artgoodies organic tea towel! Color of the Month April 2014! Wow, I can’t believe that it’s April! I think Spring is FINALLY getting here. Orange is the color of the month. Luckily, I found a few items at an estate sale this last week. I haven’t been to one in awhile, it was fun and also really awesome to find exactly what I needed to complete my vignette! 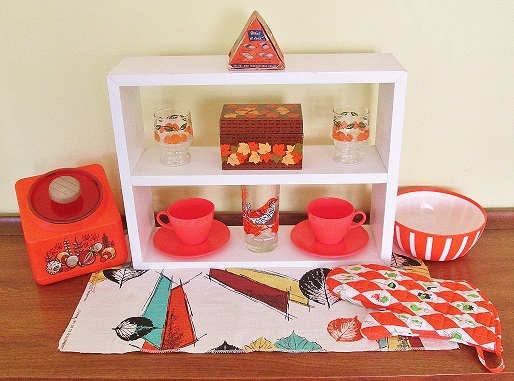 Fave vintage items: barkcloth fabric piece, bold oven mitt, orange stripe deka bowl, Rubbermaid canister, leaf recipe box, oj glasses, ad wood thrush glass. And on top, a little ravioli pasta crimper that I'm going to try someday! Fave items, this fun plaid carrot tablecloth is just in time for Easter! 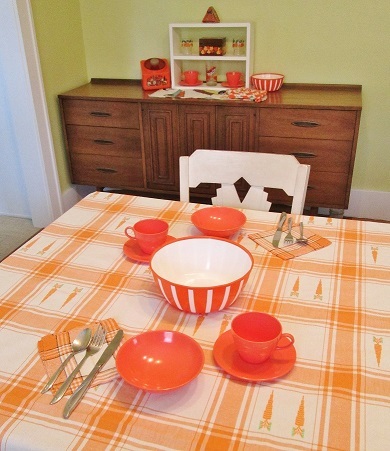 Deka orange striped bowl is bold and fun, orange plaid napkins, and bright melmac for the win!